On an island with some of the best food in the world, no matter the price point (high or low), and inhabited by food-obsessed people, there is one dish that is beloved above all others: Taiwanese beef noodle soup. It’s a veritable national dish. It’s so serious that there are national beef noodle soup competitions you can enter if you’re up to the challenge. The locals discuss new favorite spots the way everybody else casually talks about the weather. When people think noodle soup, ramen and sometimes udon or pho come to mind first, but there are so many other noodle soup options in Asia! You could say beef noodle soup is our version of Hungarian goulash, Japanese nikujaga, Russian borscht or even a French onion soup—deep, dark, savory. The Taiwanese are vehement about their beef noodle soup. Everyone has a family recipe, and everyone has their favorite noodle soup shop. Since Michelin landed in Taiwan in March 2018, eight beef noodle soup shops have landed on its Bib Gourmand list—more global recognition for this iconic dish. Everybody’s even got their own opinion about the history of beef noodle soup, it turns out. I was astonished by the number of fiery comments claiming various truths about the history of this dish on our Taiwan webisode. While we featured a lot of foods in the video, most of the 200+ comments ended up being about beef noodle soup. 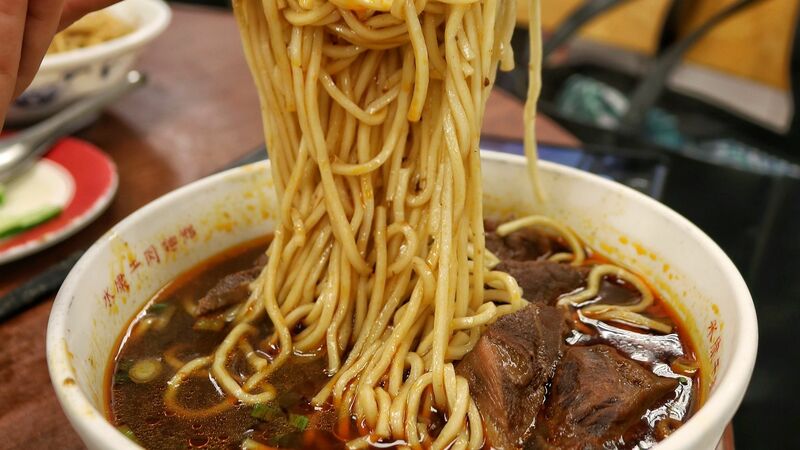 Now so beloved, Taiwanese beef noodle soup has humble origins. “When we were young, we didn’t have so many fancy foods,” says former Taiwan Elle editor turned food radio host Cindy Hsu. Cows were used to work the fields, and once they became too old to work, they’d dispatch and make use of the whole animal to feed a big family and a whole lot more people for days. This is my favorite dish that Mom would cook for me. Upon learning of her Stage 4 non-smoking lung cancer diagnosis, I started cooking this dish myself with abandon. I procured a commercial-sized stock pot (the largest one I could fathom filling up on my own) from NYC’s Chinatown and lugged it back to my apartment in Williamsburg. 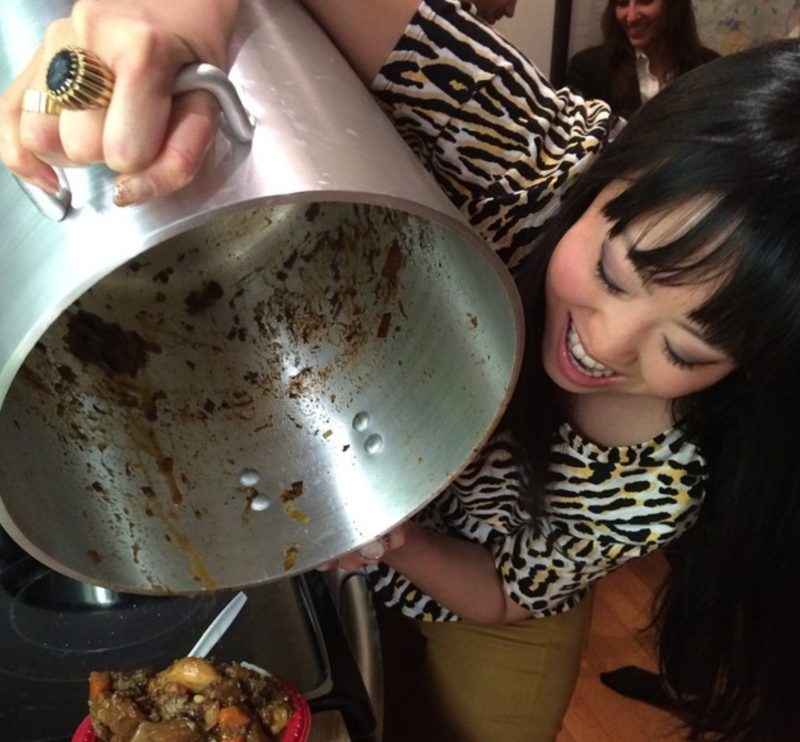 On January 6, 2015 I hosted the first #HsuSoup popup dinner party in my Williamsburg apartment. I had 25 chefs, restaurateurs, journalists and friends over for my first #HsuSoup. Then, as they do now, friends, including Journy cofounder Susan, would swoop in as #HsuSoup sous chefs for my Taiwanese beef noodle soup popup. I’ve taken Mom’s simple home recipe and experimented with it, incorporating techniques and (secret!) ingredients I’ve gathered from culinary school and intense travels around the world. She tsk tsks me, saying that I’m over-complicating the recipe. Yes, this is not hard to make— when you start with quality, which is readily available in Taiwan. There is no one “correct” version in Taiwan, and I’m on a years-long quest for my perfect rendition to share with you. I’ve cooked this dish now for 1 to 10 to 100 people. And our recent shoot trip #journyxtaiwan in partnership with the Taiwan Tourism Bureau was an opportunity for some serious R&D. What Makes The Perfect Beef Noodle Soup? All of the components of beef noodle soup matter: the soup, the meat, the noodles—and any bonus accoutrements. They vary in style and execution, so many different permutations resulting in the bowl that lands in front of you. And when all of the parts are done well and in harmony, it is nirvana. While the permutations are endless, there are two main broth flavors you must know. Hong shao (紅燒), literally red braised, is a soup with a base of beef that’s been braised in soy sauce. When people talk about Taiwanese beef noodle soup, they’re most likely referring to this version. It’s got five spice, extra star anise, loads of ginger and fermented bean sauce. Qing dun (清燉) is a lighter, clear broth. When done right, it can be a consomme-like revelation—soup doesn’t have to be made in the French way to have pure, focused flavor. When made imperfectly, the beefy taste may be “stinky”—as my mother would declare out-loud so bluntly. Speaking of, fine dining chef Lanshu Chen, of Asia’s 50 Best Le Mout, trumps us all with her rendition. At her noodle soup shop, Gubami, in the city of Taichung, Lanshu combines French and Taiwanese technique without losing the homestyle comfort feeling this dish is supposed to have. The effort results in a broth that is breathtaking. It’s all about balance and proper integration of ingredients. The broth should have richness, clarity and just the right amount of ginger and star anise kick to it. Acidity, like in a French boullion, is important to keep the palate wanting more; this may be achieved by tomatoes or Shaoxing wine for instance. There might be a barely noticeable touch of sweetness to round it out, say, with Heinz ketchup or traditional Chinese rock sugar. This is more likely dolled up with red chili oil and other hot-spicy flavorings. I’ve gone bonkers and added numbing, tingly Szechuan peppercorns to mine. The level of hot-spice is a personal preference. The soup may already come with some level of spiciness, and there are often chili condiments on the table for you to adjust your own bowl to taste. The texture of the broth is less often discussed. When made at home, beef noodle soup can get thick like a rustic stew, desirable in its own way. In a restaurant though, the beauty is in a broth that has a sparkling clarity (you can actually see to the bottom of your spoon) while holding a ton of flavor. It’s delicate but still has enough collagen in the liquid to offer a tongue-coating pleasure. Typically wheat noodles, they can be curvy or straight and of varying thickness. They should be cooked a little more than al dente, accounting for the noodles continuing to soften in the hot broth and still maintaining that chewy ‘QQ’ texture the Taiwanese love so much. Most shops use factory-made noodles, and they can be excellent. But if you happen upon a shop that makes hand-pulled noodles, and they make them right, you’re in for a treat. You might be offered a choice of thick, thin or sometimes even dao xiao (that is, knife-cut noodles). All are good, and you might pair a thicker noodle with a more hearty, robust-flavored broth. A thinner noodle goes well with the qin dun, light clear broth. If dao xiao is offered, I can never resist these uneven, perfectly imperfect, extra springy noodles. Tender chunks of beef with varying textures. There’s no need to use the typical, choicest cuts here—the funky, jiggly bits do well when stewed for at minimum three hours, better four to five hours. That way you get meatiness with moments of, again, that ‘QQ’ springy texture. I find that the stew meat sold in standard Western supermarkets is too dainty and pristine for the ideal beef noodle soup. Best go to your local whole animal butcher or a Chinese (or other ethnic, say, Latin) grocer. The Taiwanese are so obsessed with the non-meat parts that at many restaurants you have the option of ordering all meat or a half tendon, half meat mix (just say ban jin ban rou). For all this talk of humble cuts of beef though, at Gubami, they use Japanese wagyu beef—and we’re not complaining. Restaurants will garnish with greens—bok choy or spinach. This is one of my absolute favorite ways to eat my greens in great quantities, soaking up all that meaty essence. Mom would put in more vegetables that most restaurants would ever bother with. So, plenty of onions, green onions, tomatoes, carrots, potato, daikon. What’s fun is putting into the pot whatever vegetables you feel like or are in season—like rutabaga...or even okra. Typical toppings include chopped cilantro and pickled mustard greens for extra aroma and acidity. It can go from simple to indulgent—e.g. get the duck blood cake at Li Hsiang, a Journy favorite. 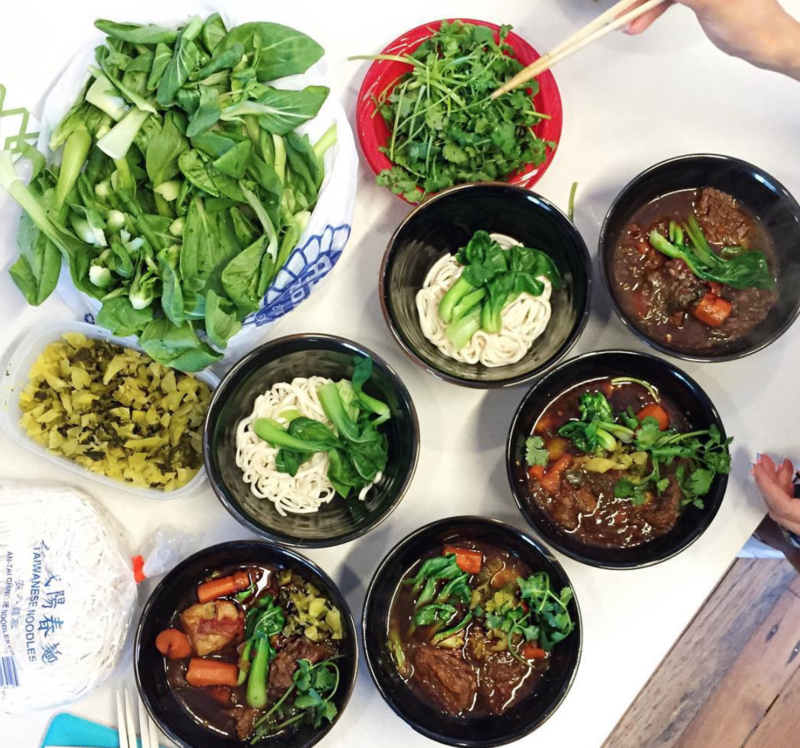 “When we were students on a budget, we’d get beef noodle soup from the shop that didn’t have a lot of meat in it, but the noodles and soup—and the toppings were still so satisfying,” says Cindy. I eat this dish the way it was meant to be eaten, I suppose. don’t need a lot of meat in my beef noodle soup; I’m more concerned with the noodles and the broth. In case you can’t get to Taiwan anytime soon, this is a dish just as good home-cooked. Mom would say that a restaurant doesn’t love you as much as your own mother does, so they wouldn’t bother prepping all the extra vegetables and keeping the broth honest, filled with nutrients and not-too-salty. And toppings, I like toppings. 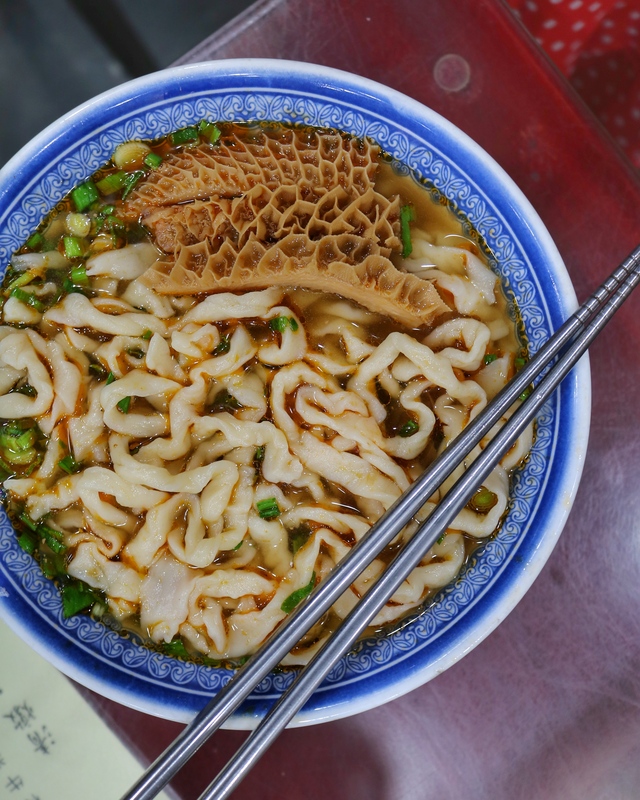 And if you are headed to Taiwan, let your Journy trip designer know you’d like to do a beef noodle soup tour on your trip.